More than an introduction to art and art history, Art Up Close: From Ancient to Modern is a veritable learning tool. D’Harcourt has selected 23 art masterpieces from around the world, tagged each one with significance, and encouraged interaction with them. She has made them all matter and given them context. Readers will remember what they see here. Divided into two basic sections, the first 46 pages are full page, full color reproductions of each artwork. Artist, title of the work, and the date are provided. Around the borders 10–12 features have been isolated and magnified. The challenge is to search the picture for each particular feature. This entertaining task promotes artistic intimacy, educational awareness, and a deepening relationship between the viewer and what is being viewed. The works selected tell a progressive and chronological story covering the gamut of historical eras starting with the Egyptian papyrus paintings from 1300s BCE. A Byzantine mosaic (500 CE), an Arabic manuscript (1400s), the Limburg brothers illumination (1416), Jan van Eyck and other 15th century European painters, and an Aztec manuscript (1500s) are included. Renaissance, Baroque, Japanese, Impressionism, Expressionism, Surrealism, Cubism styles are all represented. Once the reader has taken time to absorb the pieces themselves, they then arrive at the second part of the book where each masterpiece is given just the right amount of briefing. For instance, with Paulo Uccello’s The Battle of San Romano (c. 1440), one is reminded that this was a period of great discovery, exploration and scientific ideas. The mathematics of perspective were being worked out and Uccello was very much focused on applying these concepts to his painting. It is good that the page numbers of the paintings are included as a cross reference, because there will be much flipping back and forth between the text and the image. In this manner the reader moves through history, tracking developments, methods, and insights from the works, the artists, the culture, gaining relevant information that brings the art to life. The final few pages serve many functions. In an overview layout a dozen of the works are presented together at one glance. Each artwork is printed in a smaller format on a lift-the-flap fold. To view these collectives in one page spread invites contemplation and comparison, just as it would if they were hung on a wall in the same room of a museum. Underneath the flap, answers to the hide and seek from the first part of the book are revealed. More facts are given as well. With Uccello, as the example, one learns additionally that he was born in Florence in 1397. He was originally apprenticed as a sculptor and was actually a well-rounded artist. Uccello was not his given surname (di Dono) but a nickname, meaning ‘bird’ in Italian, and bestowed upon him because he liked to include them in his work—a quirky fact to mention considering there are zero birds in the selected painting. Thus one receives general as well as specific references in these few pages. 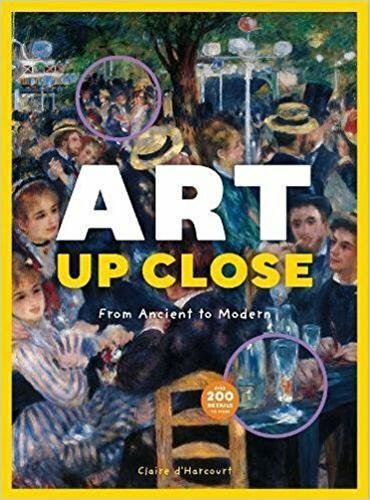 Art Up Close contains great variety, excellent selection, and attractive presentation: a wonderful way to teach art history. This intriguing and age-appropriate book follows on the heels of d’Harcourt’s companion project Masterpieces Up Close (2016), a similarly designed volume.